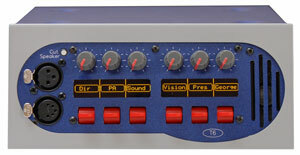 Talkback24 is a twenty four square matrix, four wire talkback system. It is PC programmable, includes full IFB facilities, and can support any combination of talkback panels and four wires, up to a maximum of twenty four. The Talkback24 may be used in conjunction with our CT600 camera talkback switcher to effectively bring the port count up to 30. All panels include a volume control for each key. 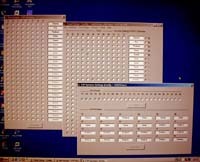 Shown above is our 1RU T12 panel with twelve keys and twelve volume controls. This is our new DT12 2RU panel with all the T12's facilities plus six character OLED labeling on all keys. The DT12 can be supplied with either a headphone jack or a 5 pin XLR headset connector. The system is based around our 1RU mainframe, with a depth of only 400mm. The unit has USB PC programming access along with an OLED display and pushbuttons for easy and fast adjustment of matrix input, output and IFB through levels. The unit uses RJ45 connectors on the rear of the unit for both four wire and panel ports. Each port has a support card within the frame which defines it as a panel or four wire. The system will accept any combination of panels or four wires up to it's maximum of twenty four. Purchase the panels and four wire cards you require just now, you can always upgrade later. Talkback24 lets you know what's happening. All system input and output levels may be adjusted directly from the front panel display. The Talkback24 is fully programmable via it's Windows (TM) interface. All sources and destinations for panel keys and volume controls may be setup as required. Individual keys and volume controls may be grouped to talk and listen to a number of source/destinations. Ports may be named and will be displayed on panels supporting labels. Eight dim groups are supported for multiple panel dimming. Ports may be forced open to selected destinations for generating open production talkback. Keys press down for momentary action, up to latch. Red LED indication of talk status (shown on OLED display on T6 panel). Green led shows incoming audio from panel or four wire (shown on OLED display on T6 panel). Headset socket. 5 pin XLR. Illuminated mic cut button (T12 only). Please see our price list for various configuration prices.